The word Transylvania is of Latin origin, meaning through the woods. The county itself, located in the western North Carolina mountains, is known as the “Land of Waterfalls” due to the 250 waterfalls located within it. The scenery has made Transylvania County a prime relocation area for retirees from Florida. The county seat is Brevard. With a population of over 33,000 residents, the county is small and rural. Transylvania is hard to define politically. Overall the county is moderately conservative, but the town of Brevard is a liberal stronghold. The outlying rural areas are strongly conservative, but the eastern half of the county is more moderate. Since the county is 92% white, this means that the white voters in the county are much more liberal than typically found in rural North Carolina. But Transylvania is similar to other western counties in the sense that the increasing liberalism of the Democratic Party has alienated voters of the working class variety. 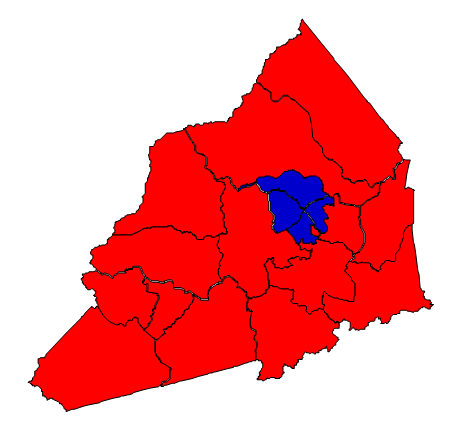 There is some evidence that Florida retirees are contributing to a blue trend in the county, but this has been counteracted by increasing Republicanism on the part of Transylvania County natives. Forecast: Transylvania has been stable politically. It contains many white, rural voters who vote based on their pocketbook; they are not as reliably conservative as those found throughout eastern North Carolina. Thus, Democrats have a chance to improve in the county, so long as they find a candidate who is more culturally appealing to Transylvania voters than Barack Obama. There is also the chance that growth in the county from out of state will help Democrats, particularly growth in the town of Brevard. However, Republicans maintain a slight edge in voter registration, and it is unlikely that even Hillary Clinton could carry the county in 2016. The growth rate from 2000 to 2010 was 12.80%; this growth favors Democrats but Republicans are in no danger of losing the county anytime soon.